Because being goth and cruelty-free to animals isn't mutually exclusive! 4. Unisex Black Creeper Boots with Silver Buckles and Pointed Toes by T.U.K. 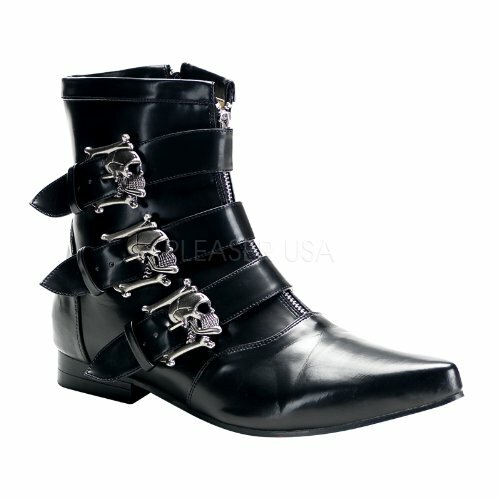 Men's black faux leather goth boot in the rock-and-roll winklepicker style. 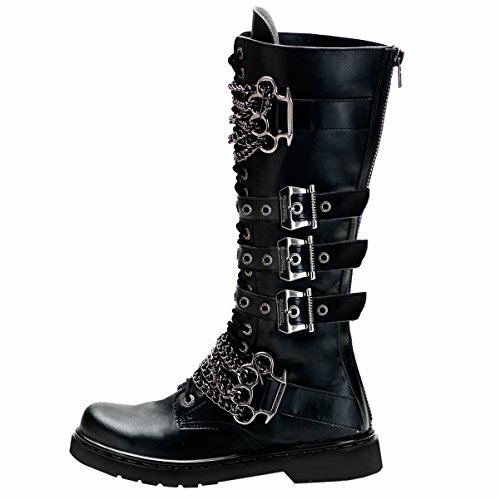 Tightens with three buckled straps embellished with detailed silver skulls on the outer side of the boot. Zips up in the front and on the side. Rises over the ankle and offers support with a padded footbed. Heel is 1" in height. Advertised as vegan: No, but the product description shows all synthetic materials. Pros: If you're looking to stand out, these dramatic boots will do the trick. The cool thing about them is that they'll add all the statement you need if you want to dress comfortably and casually. Just be prepared for lots of questions about where you got them. Cons: Reviewers say that the faux leather scratches fairly easily. This may up the (somewhat hefty) price tag with extra maintenance fees. Funky silver hologram ladies' ankle bootie with sewn-in black faux leather bats on the foot and the back of the platform sole. Platform is a good 3" plus an extra couple from the super chunky heel. Boot laces up in the front combat-style with a black bootlace. Heel zips all the way down so you can easily kick off the boot. Advertised as vegan: Yes, at least partly in the description: "black vegan leather" (for the bats). The rest of the boot is polyurethane. Pros: The hologram look is on-trend. These boots are so psychedelic and shiny you'll be hard to miss on a night out. Perfect for a long, flowy skirt — just make sure it stops at your ankles so you can show off those killer boots. The height is not for the faint of heart, but the chunkiness of the heel should help you keep your balance while you're walking on an extra five inches between the platform sole and the heel. Cons: Might not be good for all-day wear, but good for an evening out. Trendy women's thigh high boot in black faux suede featuring a steampunk top-to-bottom lace-up front, feminine rounded toe and tapered stacked heel. Inner side zipper goes almost all the way to the top of the boot so you can remove it with ease. Padded footbed offers support and comfort. Heel is 4" in height. Advertised as vegan: Yes, in the description. Pros: Slinky, fashionable goth-style boots that'll go seamlessly with so much in your closet. Thigh high boots are in. Pair them with a long, oversized sweater for a cozy cold weather look that slays. Cons: Because your feet are at a pretty steep angle in these boots, wearing them all day may result in some stiffness. Sophisticated unisex creeper boot in black vegan leather with a pointed toe, moc stitching and a textured sole. Features a snappy trio of silver buckled straps to fasten in the front. Platform heel is 1.25" (3/4" in the front). Has removable gel insoles for extended wear. Cleaning is quick and painless with soap and water. Advertised as vegan: Yes. The T.U.K. website says these boots are PETA-approved. Pros: They get an A for versatility. Not only are they unisex, they'll complement a witchy style with a long black skirt, a casual jeans-and-t-shirt vibe or a dressy pair of pants and button-down shirt. Great-looking boots like these aren't always built for comfort, but these are thanks to the gel insoles. Cons: The price is a little high and the feet are just a tad narrow. 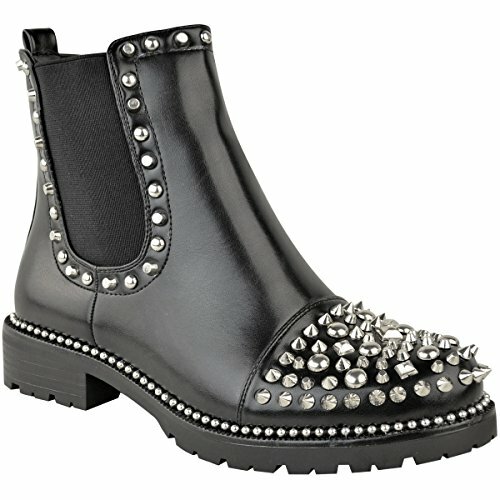 Super edgy women's black faux leather Chelsea ankle boot with assorted silver spikes and studs on the cap toe and silver studs around the top and sole. Has stretchy paneling on the outer side and a zipper on the inner side. Sole is lugged for traction and supportive with a low, comfy heel. Pull tab on the back makes it easier to get in and out of the boot. Advertised as vegan: No, but these boots are faux leather with synthetic heels. Pros: Glam goth combined with a laid-back appeal. Definitely suited to skinny jeans and leggings. Great spring and fall footwear that can be worn day or night. And you don't need to worry about the studs falling off because they're secured inside the fabric. Cons: There's no indication of waterproofing, which would really turn these into all-day, (practically) all-weather boots, though reviewers do mention some water resistance. This black vegan leather combat boot for men is all about the details: multiple silver buckle straps with metal grommets, two brass knuckle-shaped buckles and connecting chains that drape over the front of the boot. Laces in the front and zips up in the back. Has a rounded toe and 1" heel. Rises to approximately knee height. Pros: Unique and super cool goth boots with a rugged touch. You could wear these on a motorcycle with a vegan leather jacket or with a tailored coat for a dressier look. Cons: Expensive and maybe a little persnickety with all the chains and buckles. Iconic, glossy Doc Martens in cherry red synthetic leather. Traditional combat boot that laces up with a black bootlace. Pull tab at the back helps you slip your foot in. Black and brown welted sole is stitched around the top with contrasting yellow thread. Footbed and slip-resistant outsole are cushioned for all the support you need while walking around all day. Pros: Dr. Martens are durable, comfortable and always stylish. Wear them in any season with any style of pants (or dress). Great for plaid or mixed textiles and can be worn for work or leisure. Cons: A little wide, though that might be OK if you want to wear thick socks in the winter. They're not cheap, but they should last for years. Men's black faux leather creeper embellished with two rows of silver spikes along the lace-up front. Rises over the ankle with a textured platform sole 2" in height. Pull tab and inner side zipper make for simple on/off wear. Has a teal and fuchsia coffin design inside on the heel. Pros: These goth boots are somewhere between casual and dress-up. You could easily go for cuffed jeans and a tee or linen pants and a steampunk military jacket. Either way, you won't be lacking in the style department. Cons: We're not sure what sort of inner padding these boots have (or don't have). We've compiled over 25 different styles of vegan boots and where you can buy them.